Relax on the Beach, swim, surf, boogie board or just walk on the boardwalk and enjoy looking at one of the best beaches in the United States. On this page we’ve listed several amazing places to eat as well as entertaining things to do. Explore! This is our favorite fish restaurant. It is always good, pricing is reasonable and it is close. You can walk, but we usually drive. It’s a bit pricy, but has very good food. Just go for appetizers and a drink – right on the bay; just across the water from Bluewater Grill. Excellent Italian food. Mama D’s is the friendliest restaurant on earth. All the staff are very nice and treat you like gold. If you have to wait, they give you free appetizers. Music on Friday and Saturday evenings. No reservations, but the appetizers are great and they also have freshly made bread. Famous fish restaurant – simple, tasty and reasonable prices. 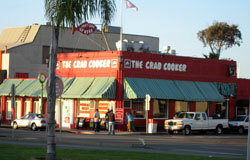 The Crab Cooker has been in Newport Beach for years. You eat on paper plates, but that does not mean second class. The food is great, cozy atmosphere and walking distance. Very good Mexican food and margaritas. It’s a very quick walk to El Ranchito, just across the street from McDonalds. Fun, cheap and serving up great ice cream. The Old Spaghetti Factory is a wonderful family restaurant. No reservations, but they will take your name over the phone within an hour from your time to eat. A good place for breakfast next to Lido Theater and Starbucks. Serving up very tasty Chinese and Thai food, Ho Sum Bistro is located on Newport Blvd. and 32nd St. across from Albertsons. While it appears to be a simple place, the food is wonderful. We sometimes just order take out and keep a menu in the left upper drawer by the wine glasses. Take an easy walk across Newport Blvd. for great fish on the Bay. Fun atmostphere, on the bay, Woody’s Wharf is a nice setting for lunch or early dinner. There are pizza places all over Newport Beach, but we like Laventina’s. Just north of McDonalds on Newport Blvd. it’s an easy walk from our place. Italian food and amazingly real Italy – including a few Mafia type to greet you. Sabatino’s is just down and around from Bluewater Grill. Very talented waiters sing while you eat and drink good food. The Regatta Café is a fun place if you like song! The Balboa Bay Club is not private for dining and breakfast is very elegant. Probably not a good idea to wear jeans here, but it is a treat to have breakfast and feel a little bit uptown. The view is nice as well. It’s pricy, but worth it to go once! Food and drink – very popular with the younger set for socializing, but they do serve a very good breakfast. From 18th St to 21 St there are lots of restaurants and bars, also a great Italian coffee and ice cream place, donut shop and of course 21 Oceanfront if you have a suitcase full of money! Find a Starbucks next to Bank of America on Lido and Newport Blvd and another in the Albertsons shopping center on 32nd street. A good alternative is the Italian Ice Cream place on the boardwalk just before the pier; they serve a nice breakfast also. If you go to Laguna Beach, try Las Brisas for Sunday brunch with incredible food and spectacular views. Dukes at Huntington Beach is located on the oceanfront and has great seafood oceanfront. Surfing – Newport Beach is one of the best places in California. Rent a board or bring your own. Lessons are also available. Just ask at the rental shops. Sunsets – enjoy the sunset or view of Catalina Island from the beach. Often these views can be just awesome. Bring your camera. Fun Zone – have fun on the rides, rent boats for the Bay, or take a ferry to Balboa Island. Located on Main St.
15th St on the boardwalk – breakfast burritos here are great. 15th St and Balboa – rent a kayak (single or double). Bike Rentals and roller blades – all over, but we go down boardwalk and turn left on about 22nd street or a street down from Mutts. Electric Boats – from Duffy’s on 2001 W. Coast Highway (949-645-6812). Take cheese, crackers, fruit and snacks plus your favorite drinks. Cruise the bay for 1.5 hours; it’s a fun time in afternoon sun. Kart Racing (or like it) – find the fastest electric cars around at K-1 Speed, 17221 Von Karman Ave., Irvine (949-250-0242). Fishing – try Davey’s Locker (949-673-1434) just past Fun Zone and the ferry. Early morning half day or all day trips, just call to find out what is running. Frozen Bananas– a must at the beach! Try the little place next to Mutt Lynchs. Tennis – there are courts right down the street on 16th street and Balboa. There are almost always courts available. We normally just ride a bike there. Golf – the best public course close to us is at Costa Mesa Country Club, which is located at 1701 Golf Course Dr, Costa Mesa (714-540-7500). It’s just a good course, nothing spectacular, but the price is also very reasonable compared to the Newport Beach courses. They have a driving range and 36 holes.